Is Your Shia Friend Asking You Questions? The death of Fatima (ra) by Miscarriage? Hasan or Hussain (ra) Who was right? If the Shia Imams know their time of death… why were they all killed or poisoned? Where was Ali r when the door of Fatima(ra) was allegedly broken? The author of the book Nahj al-Balagha – a reliable Shia source reports that Ali RadiaAllahu Anhu refused to be the Caliph after the martyrdom of Uthman when people gathered around him requesting him to assume the caliphate and besought them to accept their leadership. These statements from the Imam nullifies the Shia madhab in totality, for how can he ask to be relieved from a post you believe has been ordained by Allah and acceptance of which Allah made compulsory upon all mankind and which you claim that Ali himself used to ask Abu Bakr to return to him? 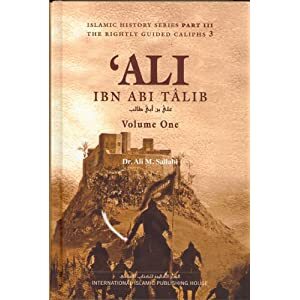 Al-Hasan ibn Ali (ra) ceded the caliphate in favour of Muawiyah (ra) and sought peace with him, at a time when he was strong enough to keep on fighting – considering the enormous number of his army and helpers. On the other side, we find that his brother al-Husain (ra) – revolted against Yazid at a time when he was in dire need of an army of helpers to defend his cause, a time when it would have been better to give up and seek peace. One of these two great men must be right and the other wrong, because if al-Hasan’s secession joined with his ability to fight is the correct idea and action to be taken, then al-Husain’s revolt at a time he was devoid of any force would definitely be wrong. And if Al-Hasan’s revolt in weakness was correct, then the secession of al-Hasan when at full strength must be wrong. This surely puts the shias in very difficult dilema,for if they say both were correct, they will be combining two contradicting actions and this will nullify the foundations of their madhab. But if they claim that al-Hasan’s action was wrong, then they must consider his being an imam to be null and void and the nullification of his imammah would result in nullifying the immamah and infallibility of his father who gave him the legal mandate of being an imam after him. The same holds true if they say that al-Husain’s action was false for that will necessarily invalidate him imamah and infallibility, which will consequently nullify the imamah and infallibility of his whole progeny. If the basic foundation is false, whatever stems from it automatically becomes false. Al-Kafi is a collection of Hadiths attributed to the prophet Muhamad p.b.u.h and The Infallible Imams -according to Shia- and like AhlSunnah, who give much importance to their Hadith book (Saheeh AlBukhari), Shia give the same or maybe even more importance to their Book (Al-Kafi) . Unlike AhlSunnah who call AlBukhari’s Book as (Saheeh AlBukhari), Shia do not call Al-Kafi as (Saheeh Al-Kafi), nevertheless, Shia treat Al-Kafi as it is (Saheeh) and their most reliable scholars declare it as a (Saheeh) . The Shias claim that Fatima( Radiallahu Anhu) the dear daughter of Rasool Allah sallalahu alayhe wasallam was disgraced at the time of Abu Bakr RadiaAllahu Anhu and that her ribs were broken and her house was nearly burnt and she was made to miscarry a child in her womb whom they named Al Muhsin. The question here is where was Ali radiallahuanhu and what was his stance on the issue? Why didn’t he collect and deliver what they believe was her right and return it to her despite what is known historically of his excessive courage and bravery.? Death of Fatima(ra) by Miscarriage? The question here is, would a father give his deal and most beloved sons the names of his most bitter enemies? What more if that father was Ali RadiaAllahu Anhhu. Why would Ali name his sons with the same names of those you claim to be his enemies? How can any reasonable person name his beloved ones with the same names of his bitter enemies? Are you people aware of the fact that Ali was the first member of the Quraish tribe to name his sons Abu Bakr,Umar and Uthman. Question 2: Ali (r) accepting allegience to Abu Bakr and Umar (r)? Q2: The Shias claim that Abu Bakr and Umar (r) were unbelievers. But we find that Ali (r), an infallible Imam according to the shias, accepted and endorsed their caliphates and pledged his allegiance to each of them, one after the other and never revolted against them. Here one must accept that Ali was not infallible, because he gave his allegiance to two infidels, two Nasibis, two oppressors (Astaghfirullah) and accepted them as caliphs, and this , ofcourse, nullifies his infallibility, as he may be seen as an accomplice to oppression, for he had helped two oppressors,an action that is unbecoming of an infallible imam. Or they must accept his actions to be right because they (Abu Bakr and Umar) were two believing, truthful and just caliphs. If this latter alternative is the right choice, then the shias have totally gone against their imam, for we find them abusing, vilifying and speaking ill of Abu Bakr and Umar (ra) and do not accept them as caliphs. One is therefore left confused, either to follow the steps of their first infallable Imam Ali or of the Shias who have gone against his practice. First: That Ali (r) was not infallible, for he gave his daughter in marriage to an unbeliever and to believe this definitely contradicts the main foundation of the Shia Ideology. Not only this, it goes further to nullify the claim of infallibility of all other imams who came after him. Second: That Umar (r) was a Muslim and that Ali accepted to be his father in law and accepted him to be his son-in-law. Al-Bada means to appear after having been hidden. It also refers to the birth of a new opinion. Both these meanings suggest that ignorance preceded knowledge and are impossible in the right of Allah,but the Rafidah impute this to Allah, the Exalted. In their hadith book Usool – Al-Kafi the following hadith is attributed to Ar-Ridah. Far removed is Allah from this imperfection. Dear brothers, look at what Allah says in the Quran and compare it to the doctrine of the Shias. 12. Abu Bakr (radhiyAllahu ‘anhu) lived in the moment, using every second of his time to better himself as a Muslim. At-Tabaqaat, Ibn Sa’ad (3/203, 204), and the chain of this narration is authentic. Islam comes alive after each Karbala. Oh Really!! Author: Abdullah ibn Muhammad As-Salafi | Pages: 87 | Size: 1 MBAn important book shows the corrupt belief of Shi’ites. The author said in the introduction, “I wrote this book for a number of reasons including: (1) The increased efforts of the Shi’ites to spread their ideology in the Muslim world. (2) The danger of this deviant sect poses on Islam. (3) The ignorance of many Muslims about the danger of this deviant sect. (4) The corrupt Aqeedah (belief system) of the Shi’ites, which includes polytheism, defamation of the Quran and defamation of the Companions of the Prophet, may Allah be pleased with them all. (5) Their extreme beliefs in relation to their imams. Will the Shia admit that they reached a blocked road and they dropped Imamah altogether like Khomeini did? Which leads us to our next point, the Iranians and their leader Khomeini realized that the Mahdi was never coming out, so either they take matters into their own hands and elect a leader and rule the nation or their Shia sect was doomed to disappear, and with it all their authority and power and wealth. The philosophers from among the early Shia came up with the belief that the leader must be divinely appointed by text, and that he must be infallible and all knowing. The average laypeople from among the Shia agreed to this, they found it logical maybe. So they went to pick their leaders thus slamming their Twelver `Aqeedah against the wall! During the Occultation of the Wali al-Asr (may God hasten his reappearance), the wilayah and leadership of the Ummah devolve upon the just (‘adil] and pious [muttaqi] faqih, who is fully aware of the circumstances of his age; courageous, resourceful, and possessed of administrative ability, will assume the responsibilities of this office in accordance withArticle 107. After the demise of the eminent marji’ al-taqlid and great leader of the universal Islamic revolution, and founder of the Islamic Republic of Iran, Ayatullah al-’Uzma Imam Khumayni – quddisa sirruh al-sharif – who was recognized and accepted as marji’ and Leader by a decisive majority of the people, the task of appointing the Leader shall be vested with the experts elected by the people. The experts will review and consult among themselves concerning all the fuqaha’ possessing the qualifications specified in Articles 5 and 109. In the event they find one of them better versed in Islamic regulations, the subjects of the fiqh, or in political and social Issues, or possessing general popularity or special prominence for any of the qualifications mentioned in Article 109, they shall elect him as the Leader. Otherwise, in the absence of such a superiority, they shall elect and declare one of them as the Leader. The Leader thus elected by the Assembly of Experts shall assume all the powers of the wilayat al-amr and all the responsibilities arising therefrom. The Leader is equal with the rest of the people of the country in the eyes of law. In the Islamic Republic of Iran, the affairs of the country must be administered on the basis of public opinion expressed by the means of elections, including the election of the President, the representatives of the Islamic Consultative Assembly, and the members of councils, or by means of referenda in matters specified in other articles of this Constitution. In accordance with the command of the Qur’an contained in the verse (“Their affairs are by consultations among them” [42:38]) and (“Consult them in affairs” [3:159]), consultative bodies – such as the Islamic Consultative Assembly, the Provincial Councils, and the City, Region, District, and Village Councils and the likes of them – are the decision-making and administrative organs of the country. The nature of each of these councils, together with the manner of their formation, their jurisdiction, and scope of their duties and functions, is determined by the Constitution and laws derived from it. So Allah orders the Shia to follow the Imams of Ahlul-Bayt (who are only 12), yet they are unavailable today thus according to this introduction Allah is evil Astaghfirullah! The Shia will tell you the Mahdi exists yet they are being led by Khamine’i, this means they are committing great injustice. Which means that following Khomeini was absurd since he’s liable to err. If infallibility was essential then why elect a fallible man like Ahmadi Nijad and follow him? [It is for this reason that the Shi’ah Ithna ‘Asharis (The Twelvers) believe that only Allah can appoint a successor to the Prophet; that the ummah has no choice in this matter-its only duty is to follow such a divinely-appointed Imam or caliph. Apparently the Iranians adopted a “Sunni” constitution then. And thy Lord creates what He wills and chooses; they have no right to choose; glory be to Allah, and exalted be He above what they associate! (28:68). This is pure Shia genius right here, I’m guessing it also means I cannot make the choice of going to the toilet or what pattern is my apartment wallpaper going to be. Maybe the writer of this book can ask his 13th Imam Khomeini. Khomeini and his followers all gathered in their parliament or in Saqifat bani Sa`idah as I like to call it, and they appointed their own fallible men. May Allah guide us to what he loves and pleases. The way of the Shia is to cling to any random weak narration and make it an undisputed historical fact if it happens to agree with their beliefs and if it supports their case against the companions of the Prophet (SAWS). However, if a narration is quoted against them, you will see them researching and citing sources and studying the authenticity and the text and trying to give various interpretations in order to defend their Madhab. And finally he declares on page 874, that all those narrations are “zero” and they amount to nothing at all! I say: First of all, if this hypocrite were to apply his methods of weakening narrations, to all the Shia books of Hadith, then their entire library of books would become one big zero, not one narration would be left! The way of the Shia since their first appearance was a twisted one, it is a twisted reading of history that reflected negatively on their writings, which are in turn based on following their desires when it comes to accepting a narration or rejecting it. They pick the books that back up their views, and from these books they hand pick the narrations that benefit them, and from these narrations they take only the parts that suit them, and finally they interpret those parts in ways that agree to their twisted understanding of history. Also from their way, is to accept the version of history that suits them regardless of authenticity, they would pick the fabricated narration even if it is contradicted by many authentic ones. This is why their version of history is a dark and depressing one, where the first generation of Islam and best of men were turned to a bunch of thieves and hypocrites, where the great conquests of Islam were pictured as the evil ambitions of these men, and that their purpose was only to expand their influence and enjoy material wealth. Whenever a criticism is directed towards the Imamiyyah proving to them that they have a certain problem, you will see them trying to prove that their opponents the Ahlul-Sunnah have similar a similar problem. 1- Proving through Islamic texts that the matter is not a problem and that the ones throwing the accusation are wrong. 2- Agreeing that there is indeed a mistake on their part, and admitting that they have a problem, and then calling their followers to abandon it and correct it. Instead of fixing the problem and defending their Madhab, we see the Shia scholars hurling similar accusations on other Madhabs in an attempt to escape those criticisms. When the opponents of the Shia criticized them for adding the following expression to their Adhan “I bear witness that `Ali is the friend of Allah”, and they told them that this is a forbidden innovation and that the Imams narrated narrations that did not contain this expression and that they also narrated that innovations are evil, the Imami Shia scholars attacked Ahlul-Sunnah with “Prayer is better than sleep” as if telling us: “Why do you oppose us in this when we are all doing innovations at the end of the day?” . I say: There is no doubt about the corruption of this method, because the goal of this method is not to prove the truth and reach it. It’s only goal is to change the subject and escape the criticism, like two men who met and one of them told the other: “You are a thief!” so the other man responded by saying: “Well you’re also a thief!” and by doing so he admitted that he himself is one! This also makes the Shia Madhab a reactionary one that is affected by the Madhab of Ahlul-Sunnah, and they would follow them like their tail, so whatever Ahlul-Sunnah agree on or decide will be the standard to be used in authenticating or weakening or proving right from wrong. Also this method is based on the opponent being from Ahlul-Sunnah, so what if the opponents were from the Waqifi Shia or even a Twelver such as ibn Babaweih al-Qummi? Would this method work with him? Or would the Shia scholars be stuck then? More importantly what will be their answer in front of Allah on the day of judgment? This is why it is the duty of every Shia that when he sees one of their scholars on the Mimbar defending his Madhab by attacking Ahlul-Sunnah, that he should tell him to abandon this twisted method and give a proper scholarly refutation to the problem. This is the first part from the book “al-Salatu Khayrun min al-Nawm” by the ex-Shia al-Baseer may Allah reward him. This book is far more than a biography, as it discusses major issues that have their origins in the early decades of Islam, the repercussions of which are still felt today. In this book, Dr. Sallabi guides the reader through a myriad of hadiths and reports, peeling away the centuries-old layer of fabrications and distortions through which hostile elements both in the Muslim world and beyond sought to conceal the truth. What emerges is a clear picture of the first great turmoil that engulfed the Muslim world and how the noble Companions of the Prophet and the members of his family worked together to resolve these momentous issues, following the guidance and teaching brought by the Messenger of Allah. The true battle for hearts and minds is that which is raging in the Muslim world today, where many vested interests are seeking to distort the very self-image of the Muslims. It is high time for us to reclaim our history and to stop letting others tell it for us. This book is of great importance as it sets the record straight on a period of our history that is of major significance. Every Muslim who cares about the big issues faced by Islam and Muslims should read this book. Here is another excellent book exposing the shia religion and its refutation. However it is in Urdu language. For those who want to delve deeper into understanding the shia religion and its refutation by one of the best Ahlus Sunnah Scholar Ibn Taymiyyah (ra), should definitely read this book. It is available as a pdf and I originally downloaded it from here. Jazakallah to those who made it available. Here is the foreword by the translator. There is no god but Allah , Muhammad is the Messenger of Allah and Ali is the Wali and Wasi of Rasool Allah. Now lets see what is the Kalimah of Ali RadiaAllahu Anhum from their own shia source ‘Nahjul Balagha’. “Nahjul Balagha” is a book containing the sermons of Ali radiallahu anhuma and is a very highly regarded book by the Shias. 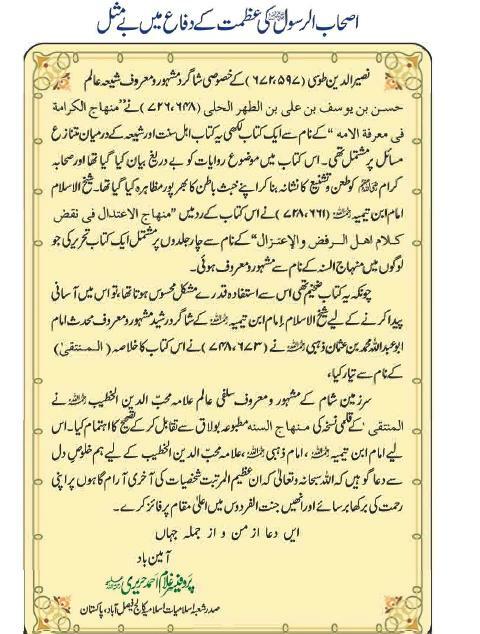 However the source of this book is unknown and its authenticity is questionable so just like the Bible, it contain sermons of Ali, some of which appear to be fabricated and some appear to be the real words of Ali as they are aggreable to Quran and Sunnah. So in one of the Sermons of this book, you can read the Kalimah of Ali RadiAllahu Anhum and decide for your self as to who loves and follows Ali more. The Shias or the Ahlus Sunnah. We love Rasool Allah and his Sahaba and love to follow their way that is why the Kalimah of the Ahlas Sunnah Wal Jamah is the same as the Kalimah of Ali (ra) as it was the same as the Kalimah of Abu Bakr and Umar and Usman (ra) and of Rasool Allah Sallalahu Alayhe Wasallam. A must read classical book explaining the Shia creed, beliefs and deviations.